Posted by Dave Emory ⋅ April 20, 2015Post a comment Email This Post Print This Post Tweet This! COMMENT: A recent Holocaust deniers’ conference in London featured–among other guests–one Lady Michele Renouf, whose late former husband worked with Hermann Abs, Nazi Germany’s most important banker before, during and after World War II. Her marriage to an Abs associate may well have been the decisive experience in steering her toward her present calling as a Holocaust-denying associate of David Irving. Abs was a key associate of the remarkable and deadly Bormann capital network, the economic component of a Third Reich gone underground. Have postwar Nazi monies influenced the political vector of Ms. Renouf? 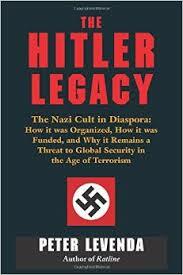 “Nazi Invasion of London Exposed: World’s Top Holocaust Deniers . . . Filmed at Secret Hate Race Rally Where Jews Are Referred to as the ‘Enemy'” by Nick Craven, Paul Cahalan and Simon Murphy; The Daily Mail [UK]; 4/19/2015. ‘On the face of it, their proceedings should be investigated to ascertain whether criminal offences have been committed, including incitement to racial hatred.’ . . . .
. . . . The star speaker at the event was Spanish self-confessed Nazi Pedro Varela, 57, whose adoration for Adolf Hitler and the murderous Third Reich is unbridled. Our team of reporters and photographers watched as the participants – including a handful of women – gathered under Victoria Station clock, awaiting orders. Gerry Gable, editor and publisher of anti-Fascist Searchlight magazine and leading expert on the extreme Right, who worked with the MoS on our investigation, said last night: ‘This is the biggest and most significant meeting of Holocaust deniers that Britain has ever seen. It is a very worrying development.’ . . .
. . . . Australian-born former model Lady Michele Renouf, 69, who has defended prominent Holocaust deniers such as David Irving and has said: ‘People should have the freedom to question the accepted view of what happened’. . . .
“Lady Renouf”; Biographical Encyclopedia of Revisionism. . . . . She and [Count Daniel] Griaznoff were divorced in 1990, and in 1991 she married Sir Francis Renouf, an international financier who had worked alongside Hermann Abs of the Deutsche Bank to restore Germany’s postwar banking system…. ….R. has become increasingly known in recent years for her support of prominent Revisionists. Her interest in World War II and the ‘Holocaust’ began in 2000, when she read a quotation from David Irving in a newspaper article regarding Irving’s libel case against rival historian Deborah Lipstadt. She attended the two month long hearing and became impressed with Irving’s case, saying “I found on Irving’s side of the courtroom a solitary person representing himself, backed up by enormous forensic research and tremendously capable debate based on substance and fact… On the other side of the courtroom I saw 21-25 people with laptops connected it seems to the Israeli government.” ….